Less than a week ago, CNN announced that Facebook experienced its “worst hack ever.” In mid-September, Facebook engineers noticed unusual activity on the platform. The cyber attack was the worst the social media site has ever had, affecting more than 50 million users. Articles voicing user concerns around cyber attacks are common these days, making many questions whether or not the cyberspace is a safe place for important information. 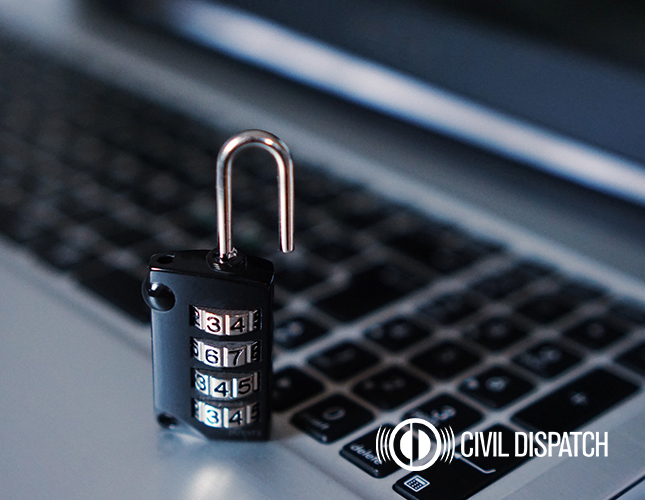 In honor of October being National Cyber Security Month, Civil Dispatch has your key tips to help secure your online accounts and product your identity. We are all guilty of constantly clicking “remind me later” for software updates on our phones, tablets and computers. Software updates are time-consuming and annoying, but they are incredibly important to maintain. Software updates install the latest security updates on your devices to help protect against hackers. Only update software on secure websites. Computer viruses often manifest as fake software updates. So while it’s important to keep your devices and programs updated, you have to make sure you are using the correct sites to do so. When you visit a website and it suggests you update a program, such as Adobe Flash, it is likely a phishing scam. Visit the Adobe website to confirm whether the program truly does need to be updated. Platforms such as Instagram, Amazon, Twitter and Facebook offer two-factor authentication. When activated, anyone attempting to log in to your account has to enter a code sent to you VIA text message. This prevents hackers from accessing your account just by obtaining your password. Keep sensitive browsing information on your own devices. Information such as bank account numbers, social security numbers or credit card numbers should only be entered on devices that belong to you. Otherwise, the computer may save your information or it could be accessed on public wifi. Be mindful of what you post on social media. Even with privacy settings at the highest level, people have a number of ways to gather information from your social media channels. Be smart about what you post on your platforms, and avoid posting information such as your phone number or address. Security such as Avast or Norton can help detect potentially dangerous websites or emails in order to prevent malware from infecting your computer. Don’t use the same password for every single account. In a world where most websites require accounts, it’s common to have one or two go-to passwords to use on a rotation, but you shouldn’t do that. Use individual, unique and strong passwords for every account you open in order to prevent someone from gaining access to all of your accounts. Emails are another common way hackers obtain your information or infect your device with malware. If you don’t know the sender, don’t open it. Additionally, be mindful of senders that “might” be legit. Hackers will sometimes pretend to send emails from your bank, requesting you to log into your account. Usually, there is a tell-tale sign that something is amiss, such as a slight misspelling in the email address or odd punctuation in the subject line.